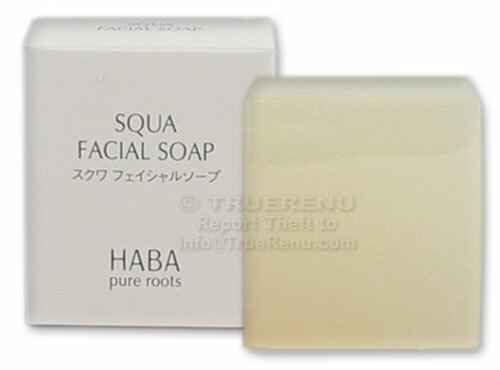 Enriched with 3% Squalane, Royal Jelly Extract and Soybean Seed Extract, this is a lovely clear facial soap from Japan. Leaves your skin soft and moisturized. Made in Japan, comes with English instructions. Creates a velvety emulsion that penetrates and cleanses pores more gently than regular body soap. Contains squalane, a pure oleic acid oil and an extremely powerful moisturizer. Removes most makeup (use makeup remover for sensitive eye area). Cleans without drying your skin. A beautiful square of clear soap, filled with squalane, your skin's soul mate. Cleans without drying your skin. Emulsify with water, massage into face with cleansing brush or pad, and then rinse thoroughly with warm water. Ingredients: Sekken-Na/K, Sorbitol, Glycerin, Squalane, Water, Dipotassium Glycyrrhizate, Alcohol, Butylene Glycol, Pentasodium Pentetate, Tetrasodium Eitidronate, Tocopherol, Royal Jelly Extract, Glycine Soja (Soybean) Seed Extract. Product Size: Net Weight: 100 grams, or about 3.5 ounces. Medicated charcoal in a plant based moisturizing soap cleans dirt and oil in pores and removes dead skin cells all over your body. Bamboo vinegar disinfects without drying, and soothes rough or sensitive skin. Squalane moisturizer, penetrates even the driest, roughest skin. For use all over body and face. Page displayed in: 0.2813 seconds.